From rich, colourful automotive paintings with overlay techniques to 3D sculpting, what drives David Chapple and what is his hidden message? David, in your work ‘Majestic Glory’, I notice you have the word Jesus on the number plate of the car. I wanted to do something with the licence plates to honour God and open the conversational doors with people and a lot of people do enquire about it. The licence plate on the actual truck that I drive reads the same thing ‘J3ZU5’and it’s just my way of thanking God for blessing me with this talent. If you zoom in on the 1960 Empower, it says Lord. It has actually really opened the doors for me. I had a book published with a wonderful Christian writer named Ken Owen, who used to be the Head Chapel for the Raiders for Christ and he would bless all the dragster racers before they went down the quarter mile drag. How did you get started painting cars? I started sitting in front of the tv drawing sports figures when I was a little boy. My father always loved VW’s and he bought a 1969 VW beetle for my grandfather and that just opened the doors for me. I was 14 years old when I started drawing cars and they quickly became my passion. When I was at senior high school, I won the Congressional Award for the State of Michigan with one of my paintings. I then received a scholarship to go to the Hope College in Holland Michigan and then in my junior year in college, I was commissioned by the Hope College to paint three large paintings for the student commission. It was a natural fit and it’s just been a life long journey with the automobile. After I graduated, I started doing certain car events and I haven’t looked back. One of your paintings is titled ‘Love Bugs’. What is behind the name? My wife and I have recently moved back to my home town and bought a house across the street from my Mum and Dad. We love being with family. My Dad actually loves that painting. The first paintings that I did were of his cars and he still actually has them in his collection, along with his expanded car collection. He has a ‘68 Karmann convertible, a beautiful 1958 VW Beetle convertible which is flawless, and I actually still have my original 1969 Beetle which was the first one that he purchased. We have a lot of fun with them. I notice you are using the same kind of colour schemes throughout all your works. Is the choice of colours your signature style and how did you develop that? Being an artist is finding your own path and I am someone who has always tried to create my own pallet, my own cultural work and something which no-one has ever seen. So it just came out and was a natural progression. I think as you get older as an artist, your colour choices become more complex. You try to experiment and come out with different colours which appeal to your eye. Your ‘Love Bugs’ painting is quite unique and I notice quite a difference in your work between your commissions and your freestyle, which is much more artistic. Do you see that yourself? Oh yes, the best clients are the ones who let you create exactly what you want to create and don’t give you parameters or tell you how to do your work. That’s when I do my best work. Back to the Love Bug, that was the first in a series of paintings. I don’t use a computer at all. Everything you see is from my mind’s eye and how I want to convey colours and the overlay. That style was very difficult for me to create. Sometimes it took me months upon months to finish a couple of pieces. I can imagine. 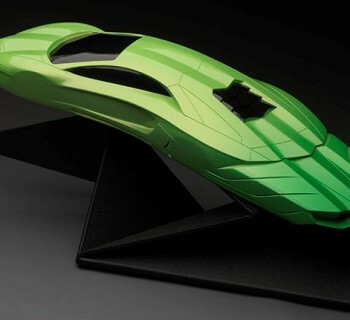 They are kind of abstract, yet showing the iconic design of the cars itself. You did that with some non automotive work, like the coca cola bottles. Yes and those were a lot of fun to do. Kind of a pop art style. I really enjoyed painting those. Your painting ‘Thrust’ has such a different perceptive than what you normally see in a car painting. How do you choose that. Does it take a lof of time to find the right angle? It really does. When I am doing a layout for a painting, I will agonize over it because I want it to be a journey for the person looking at my painting. I don’t want the eye to just go to one section. I want it to have movement. In a lot of my paintings which have many cars, you will be looking down at the first car and then your eye will have to move through the painting to see the other cars. I like extreme angles when creating paintings with multiple cars. I work tediously at getting that perfect angle and I’ll work further to get it to that point and if it’s not the right angle, I don’t do the painting. So which techniques did you use in your ‘Thrust’ painting David? I had a lot of fun painting that. I like the extreme angle that no-one has seen before. I am on the ground, pretty much at pavement level looking at the thrust of the side pipe coming out. I like to paint sometimes from a ground level as if the car is coming right by you. How you would feel with that car inches away from you at that level? It’s an extreme mean look. The rear tyre is wider than the car itself and it’s really a dominant kind of appeal. Which techniques do you use? Is it water colour? Everything I do is hand painted acrylic and all done by paint brush on canvas, or on wood or substrate I think the strongest point of my work is my blending. I love to blend a perfect graduation and I sometimes spend hours achieving the perfect blend. Someone who is not educated in art might think my work is air brushed but it’s all hand painted. How do you select the car that you want to paint? When does it appeal so much to you that you have to paint it? Being a lifelong artist, I’ve gone through the classics, the ‘30s Duesenbergs to the 50s Bel Air Chevy’s, the ‘59 Cadillacs and beyond. It’s a progression and I always have to paint something I like. I don’t want to create a painting that would just sell. I paint from the heart and I think that’s important. Being an artist, you have to paint something that you can get really excited about and that’s when you do your best work. I’m really into the Ferrari’s now because I had never painted them and when your eyes are open to something new, you feel the excitement. I just love to paint them and I am all excited about it and can’t hide it. When it comes down to all my artwork, I like a clean, ultra refined, rich look. Everything that I do, I do to the best of my ability. Do you consider cars to be art? Is your art being respected outside of the automotive world? It’s mainly in the automotive world right now but I think that will change. 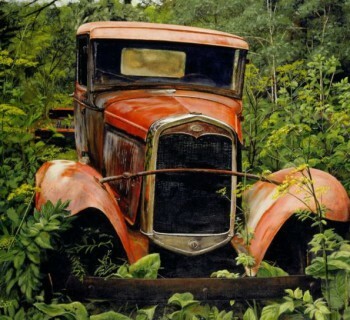 Automotive art is a genre that the art museum world needs to take notice of. 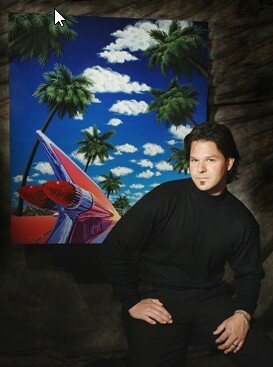 There are a lot of fine artists out there who are creating incredible automotive art and it needs to have its’ place. I think every automotive artist battles with that. I love my clientele and the position I am in. About two years ago, I became a member of the AFAS group and that is the pinnacle of every automotive artist. I also think the part of what makes automotive art so special is the people you work with and the people who come to these events. They are many of the nicest people you will ever meet. You can look at the grass being greener on the other side or you can make the most of what you have; that’s what I do, I make the most of what life gives to me. I love going to Pebble Beach and the Concourse in the USA and hopefully I can make it over to Europe soon and introduce my work there. Besides paintings, you are also doing sculptures. How did that get started? It actually started with my benches. I was given a raw flat bench for charity work. I got paid to paint on the bench. They told me to do whatever I wanted. So I painted a ‘57 Chevy on the side of it and it sold very well with their charity. So I thought ‘wow maybe I can offer this to my clientele’ and they responded well to it. Being an artist, when you go into a totally different genre or you work in a different medium, your mind gets tweaked and you become intrigued with it. If you look at the bench lines and the wood that is used, you can see that it was a natural progression into my sculpture work. My wall sculptures have the same line configuration. That was transferred from the bench to the wall sculptures and now I am doing custom furniture in the same exact lines as the bench and wall sculptures. It’s opened a whole new avenue for me creatively. I feel as if I am doing the most exploratory work of my career and I feel alive as an artist now. It’s very exciting for me. Your sculptures look as if they can be hung on the wall or placed on a table top. Yes, you can use them for both. I love creating that stuff. It’s very difficult but nothing that is good in life is easy. When you create something which has never been created before, there’s no set way of doing it. You have to explore with trial and error. Is working in 3D a lot different from working with flat paintings? I took sculpting classes in college and knew that I wanted to get back to it someday. I just didn’t know quite how but it all fell into place. My current work has set me aside from other artists, so it’s very fulfilling. The shapes and elements of your Porsche sculptures seem to follow the cockpit and the airflow of the car. Is that also the kind of involvement in your work? Yeah, it depends on the subject that I am painting. Like ‘Ribbon Candy’, that is something I was designing in my mind and it turned out wonderful. I love that piece. That was the first piece I actually sold at Pebble Beach. I love the 917 and Porsches; there is something about the flow and movement of those cars. Pictures don’t do the sculptures justice because when you move around the sculptures, they move with you and shift to the image that show speed in a wonderful way. It’s fun when I see clients who see my sculptures for real and see first hand how they come to life. There are a couple of AFAS members who also do sculptures. Do you share ideas and encourage each other? I think we all encourage each other. The nice part about it is that we all have different techniques and styles. I am a painter and when I do a form, I have to think how a painting will balance on the sculpture. There are two different elements. It’s not just about creating a sculpture, I have to find a way to paint a car onto that form to convey the speed and the two work together. So it’s kind of a double edged sword when it comes to what I do. I paint on top of it and incorporate both mediums of sculpting and painting. So it’s a difficult process. 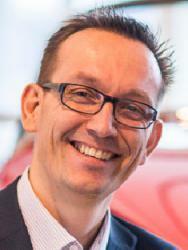 At AFAS, we want the betterment of the fine art of the automobile and I think that’s the common ground for all of us. If you would like to see more of David Chapples’ work, please visit his website.